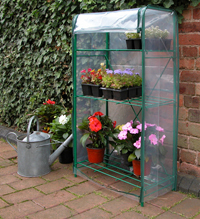 Good for limited space, to use on patios, easy to move to sun and shade, easy to assemble-no tools required. Will accommodate 9 half sized seed trays. Manufactured using plastic coated steel tube. UV stabilised twin zip cover.